We all know about an Englishman in New York from Sting’s 1988 song, but what about the Brits in Florida this summer? 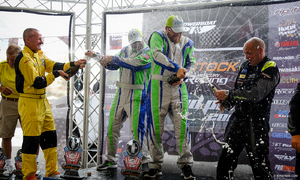 The P1 SuperStock USA Championship enticed a number of UK racers to cross the Atlantic in June to compete in the Sunshine State. The images below tell the story of their exploits. 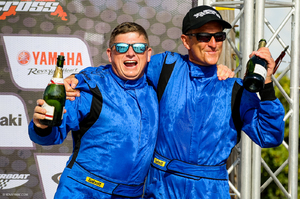 Andy Foster and Charles Morris in the GoToSteves boat celebrating in style at the end of the Grand Prix at St Pete Beach on 16th-17th June. 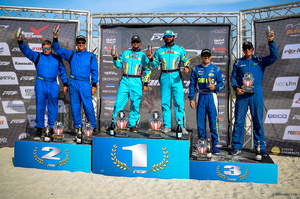 The winning team, Visit Jacksonville driven by George Ivey and navigated by Brian Lynch, on the podium in Sarasota. Brits Neil Jackson in 2nd place and Davie Finlayson and daughter Ashleigh in 3rd join in the celebrations. 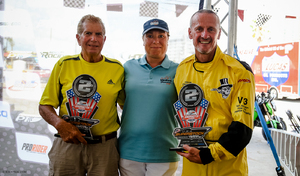 Scottish father and daughter duo Davie and Ashleigh Finlayson raced the GoToSteves boat in Sarasota and finished third. 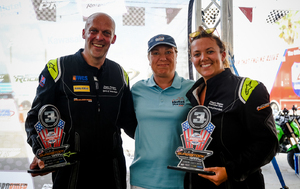 Neil Jackson and his teammate Stephon Dinolantonio are pictured above in the Visit St Pete/Clearwater boat, alongside Davie and Ashleigh Finlayson in the GoToSteves boat and 2018 P1 SuperStock USA champion Jason Morton in the UK-sponsored Gallagher insurance P1 Panther. And here’s an Interesting fact to finish with: All US ABPA race-affiliated boats with US citizens racing should have a “Stars & Bars” American flag on the rear quarter. Unfortunately, due to the design being used on both the US and UK Panther, the British Union flag was printed onto Jason Morton’s boat. By the time this “oversight” was spotted Jason had already won a couple of races, and when asked if he would like his USA flag put back on his boat Jason’s response was: ”No way man - you leave my lucky British flag on ma boat”. We will wait to see if Jason wants to race with his lucky Union Flag next season.